For the 21sttime the city of Jelgava welcomes to the most remarkable winter event in the Baltic States - the International Ice Sculpture Festival under a theme of Cinema - this February 8 to 10. The festival celebration will take place in three locations: Pasta Island (Pasta sala), Jāņa Čakstes bulvāris and Pils sala (Pilssalas iela 1). The festival offers concerts from popular musicians, show on ice, creative workshops, a market and much more. Taking into consideration the high intensity of traffic organizers kindly ask all the traffic participants to be careful. Arriving at the festival location by car it is suggested not to cross the bridge over river Lielupe in order to avoid a traffic jam. There will be provided parking lots on both of the river sides. Use the app Waze for more convenience as well as following the traffic updates, nearest parking etc. The festval’s main stage will be located at Jānis Čakste Boulevard and construction work will begin on 5th of February that is why from 5th to 8th February the boulevard will be closed for traffic at the road section from Street Ūdens to Street Raiņa; the Boulevard will still be available for pedestrians whereas on the festival days (8th to 10th February) the Boulevard will be available for visitors of the festival. Pasta Island will be closed for construction work from 28th of January till the beginning of the festival 8th of Feburary and later available for festival visitors. Parking lot at Street Pilssalas will be closed 5th to 11th February. On 8th to 10th February at the road section from Street Akadēmijas to Jānis Čakste Boulevard Streets Ūdens and Driksas will be closed for traffic, but available for festival visitors, whereas Street Raiņa will be closed for festival organization. There is only one bridge over Driksa and Lielupe rivers, therefore high intensity of traffic and congestion is possible. Visitors for their own comfort are strongly requested not to cross the bridge, but leave their cars on a parking lot that will be available on the side of a river of which the city is entered. Whereas inhabitants could more enjoy reaching the venue by foot or using public transport. Arriving from Riga the closest parking is in a fields: in front of Jelgava castle, the parking of Zemgale Olimpic Center or Jelgava Ice hall. Arriving from highway Lietuvas a car can placed on the parking at Street Sporta 2C and other available parkings. Tour operators and travel agents can leave the busses at the parking behind Jelgava palace. Please note – the exact parking is only for busses. To reach the parking it will be necessary to drive under the bridge, so the bus height should not exceed 4 meters! On Street Pilssalas, next to the Tea house the parking for disabled people will be organized. To skip the city centre and a traffic congestion use the route around it. Recommendation to use A8 highway Riga – Jelgava – Border with Lithuania (Meitene) or A9 Riga – Liepaja. Municipality in cooperation with GPS navigation software Waze has developed the map of parking lots and restrictions in real time mode, which will help visitors to plan their traffic route. Click HERE to use WAZE. The festival celebration will take place in three locations: Pasta Island, Jāņa Čakstes bulvāris and Pils sala (Pilssalas iela 1). This year, the festival gathers 30 world-known sculptors from 7 countries: Latvia, Lithuania, Russia, Belarus, Ukraine, the USA and Canada. The task for the sculptors is to portray the theme of cinema in more than 70 tons of ice. On Pasta Island will be the biggest and most impressive ice sculptures – 15 big scale sculptures carved by teams of 2 sculptors. For each sculpture a team received 2 tons of artificially frozen, crystal-clear ice blocks. Ice sculptures are placed under 7 tents with opened sides to protect the unique artwork from damage of sunlight and other weather conditions that might ruin the sculptures. 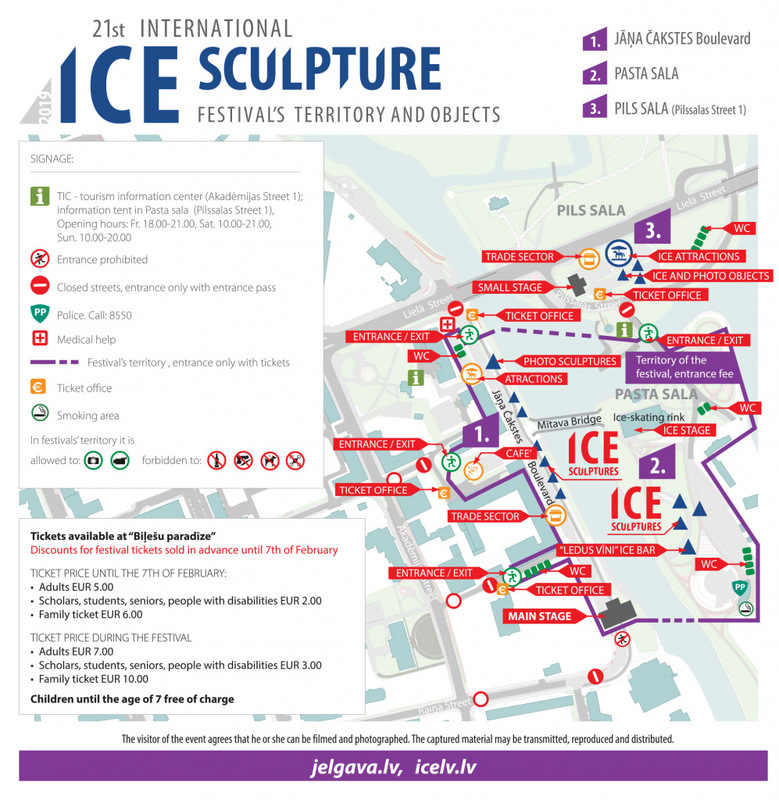 Besides the festival contest participants’ sculptures on the Pasta Island there will be the biggest sculpture of the event – “Ledus vīni” ice bar. For the first time in festival there will be a stage of ice on the ice skating rink, visit the stage to see ice theatre “Ice Republic” and a show “Ice Remix” (“Ledus Remix”). At the show cinema heroes as Aladin, Jasmin, Snow-white, Pirates of the Carribean and heroes from “Madagaskara” can be met. The very centre of the festival in general is Boulevard Jāņa Čakstes. There the main stage is placed with musicians performing such as: Lauris Reiniks, Chir Noah, X Factor Latvia 2nd season participants, Ivo Fomins, “Tautumeitas” and others. Along the boulevard 30 smaller ice sculptures will be placed as well as several photo objects. Free of charge festival area with a stage for New Jelgava’s Theatre play show for children “Cīruļputenis”. On the island will be big size photo sculptures, shadow theatre screen, different contests and activities. Especially for children built ice labyrinth and ice slide. Organiers suggest to festival visitors to purchase tickets to the festival on time and even beforehand till the 7th of February on “Biļešu Paradīze” sale points and online trading platform. To reduce the queues at ticket sales at the festival venue the sales points will be near each of the entrances as well as at the Jelgava City House of Culture (Street Kr. Barona 6). During the festival says tickets still can be purchased on “Biļešu Paradīze” online trading platform – bilesuparadie.lv and presented on a smartphone at the entrance electronically, no need to print. Visitors are strongly requested to leave home their dear pets! Entering festival area with a dog is prohibited. All the festival objects are allowed to be captured and recorded though it is forbidden to fly a drone over the territory without a legal permission of Jelgava City Council. We inform you that visitors of the festival may be filmed and photographed. The filmed and photographed material may be broadcasted, reproduced and distributed without limit.